Replica print of a homestead scenes by the Currier & Ives Company. Clearly, these wooden hexagons were once sold in a souvenir shop--who knows maybe in the 70's! Currier & Ives - Anyone Know? As I was rummaging through a second-hand store, I came across four small wooden hexagon souvenir frames with a recessed circular 19th Century homestead illustration printed in the center. At the time, I was more interested in hexagon wooden frame and was going to do away with the reproduced print, but then I noticed at the bottom of each print there was a maker’s mark. Of course, I had to google search Currier & Ives to see was this was all about. I was totally thrilled with the findings! Currier and Ives were two guys that went into business together in New York City. Their company was in operation from 1834-1907 that’s 72 years! The firm called themselves ‘the grand central depot for cheap and popular prints’ and advertised themselves as ‘colored engravings for the people.’ They hired many celebrated artists of the day who created scenic homesteads, sports, landscapes to name a few. Lithograph prints were then hand painted by a team of artist. Frances Flora Tait, who worked on picturesque American landscapes, was the first woman in the United States to make her living as a full-time artist. Currier and Ives Company published 7,500 lithograph originals and produced more than a million prints. Think about it that was more than 100 years ago folks and manual labor! At that point, I decided to keep the replica prints in the wooden frame! I choose to enhance these neglected pieces by assembling my pine cone plush birds that nest in the Spring, Summer, Fall, and Winter within the late eighteen hundreds homestead scene. A piece of artwork called Taut Skirt, which I made in college, did not survive the plane ride back to Salt Lake last fall. I clumsily tucked the artwork between my clothes, zipped up my luggage, and thought, “see you there!” Holding the broken pieces in my hands later, a sense of loss came over me. 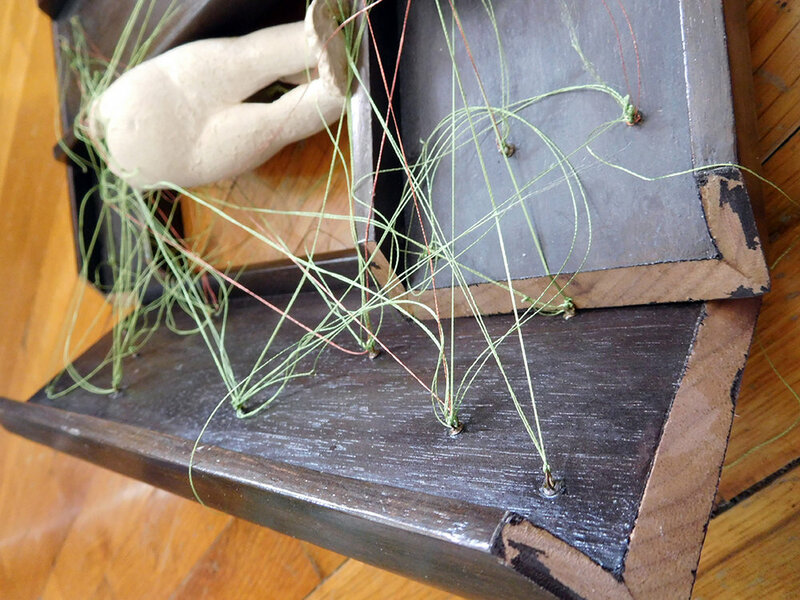 I reflected on the time I spent creating this piece—cutting and finishing the walnut wood frame, making custom eyelet rivets from copper tubing and brass wire, the two different types of mold-making processes, and the ceramic slip cast. These techniques were some of my first exposure and self-discovery in building three-dimensional work. It shaped my skill set when I was a student in the Sculpture program at KU. The dismantled artwork sat on my studio shelf till the end of winter. I decided to recycle the salvaged parts, assembling them into my current artist style --birds on a wire. Each walnut frame piece became its own small wall art display. The eyelet rivets, which were once threaded to hold the doll in the middle of the frame, became a brightly colored geometric shape to contrast the dark walnut wood. I think the small clutch of birds look very dashing in their reclaimed home. You can read about the creation of my Taut Skirt series, just scroll down! It’s one of my first blog posts. Enjoy! 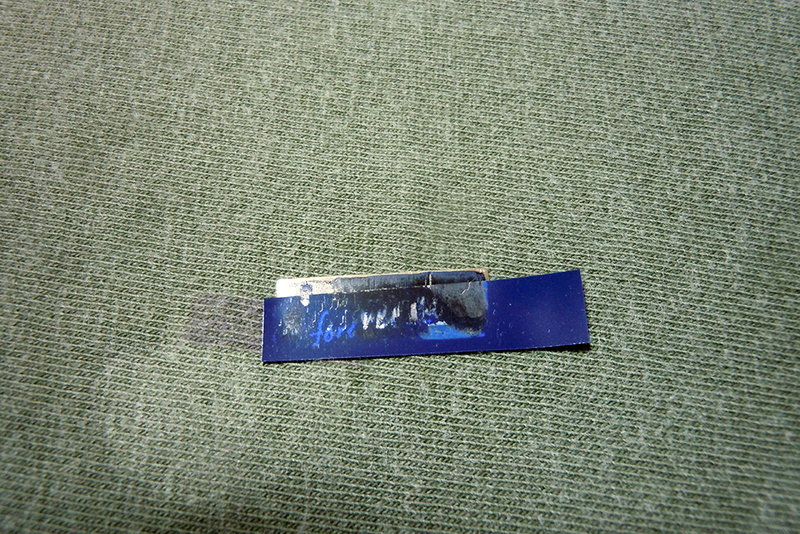 I really dove into the acid etching technique about five months ago, when I accepted a commission to design a memorial pendant reflecting the phrase "forever 32", in honor of Sarah Brook Saling's passing. Ready for the challenge, I began reviewing several handwritten ink and pencil letters written by Sarah. I wanted the etched text to be as authentic as possible. I started by scanning all those letters into my computer, and then use Photoshop to select out single characters and parts of words. 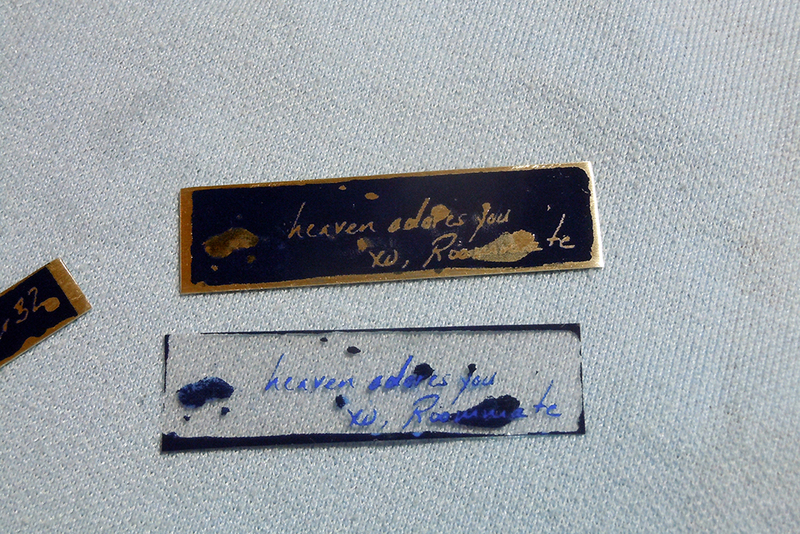 Then I was able to create realistic compositions of whole words like "adore" and "heaven" in her original handwriting. I got lucky on a few words she had written, like "roommate", and "Love ya, Sarah". After many hours adjusting, resizing, cropping, and cutting in Photoshop, I was ready to prepare the template for the final design. I hit the books again, reading more blogs, and gathering tips and tricks from other silversmith's. As much as one can read and watch demo videos to learn a new skill, nothing quite compares to learning a process through hands-on trial and error--being a student, and letting these struggles take place and taking note of necessary changes each iteration. Even though the design had been transferred to the silver at this point, it was necessary to mask the exposed edges and back of the piece not covered with the PNP paper, to protect the silver from being etched way. I used clear coat fingernail polish to mask all edges, and packing tape to mask the back. On with the etching! This is where all the magic happens! Being very careful to work with gloves and goggles in a well-ventilated area, I mixed an acidic solution of water and Ferric Nitrate, which slowly eats away sterling silver. The piece was submerged in the solution for 2 hours. Every half hour, I'd agitate the acid bath, and pick at the exposed design to loosen the etched silver with a toothpick. Once the pattern was etched deeply enough, I removed the piece from the solution, and sanded the Peel-N-Press paper away. A final bath in a product called Black Max patinas the silver a nice gunmetal blue. That dark color will remain in the etched letters, while the rest is eventually polished off. Whew! That is acid etching on silver in a nutshell! From that point, all that remained was to solder on jump rings and polish away! When all was said and done, I hope that I managed to pay a proper tribute to the remembrance of Sarah, and successfully preserve her stylized handwriting on a cherished keepsake. Happy birthday to my mom, Kim Koehn! For her 60th birthday, she unwrapped a special custom made gift from me! 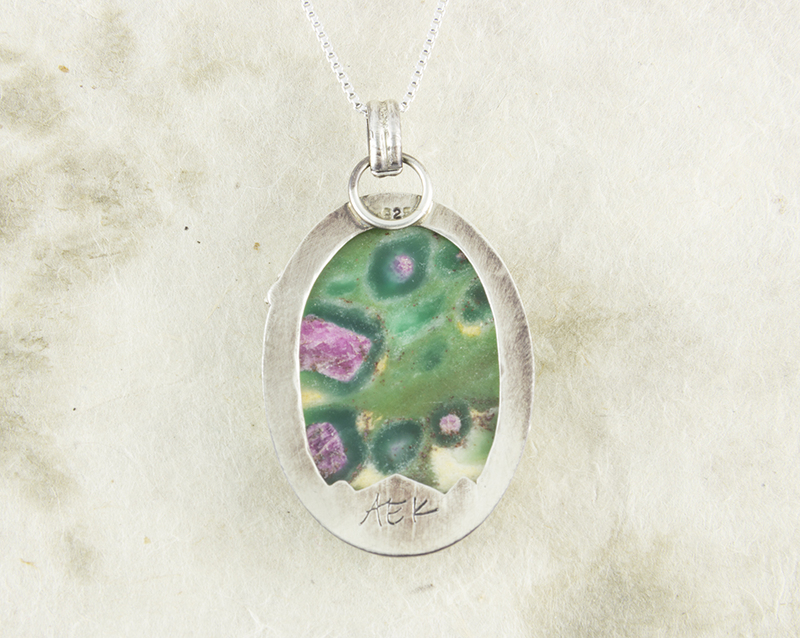 What makes this Ruby in Fuchsite pendant extra special is that it’s my first prong setting! Considering the steep learning curve, I couldn’t be more pleased with this successful ruby setting, and will treasure it for years to come. This Ruby in Fuchsite is a large oval, low-profile stone, with spectacular natural ruby inclusions, contrasting the vibrant teal and cream-colored Fuchsite stone. This cabochon nests between two elegant designer gallery wires, capped with silver ball embellishments at each arch bezel. An antique brush finish illuminates the natural stone's beautiful colors. I used a jewelry’s saw to create an open-backed silhouetted mountain design on the backside. This mountain scene is personal to me as the maker, because those enriching outdoor activities are one of the main reasons I call Salt Lake City home. I’ve be entertaining the idea of including this open back mountain design in more of my silver work, so stay tuned to witness the evolution of this design at AEK Display! Winter is coming, and it’s time to care for all your wee little backyard birds! For 4 years now, I’ve been creating lovely birdseed feeders, out of large Ponderosa pine cones, for our year round aerial residents. These cones make the perfect gift for any bird-loving friends and families! I fashion convenient gift sets in ribboned boxes, and single cones as well. These feeders are available to Salt Lake City locals, as the nature of shipping just can’t guarantee the feeder arrive in one piece. The great migration of summer birds has moved on to warmer climates, but there are many species that migrate and even winter in Utah. One beautiful bird that weathers through is the Dark-Eyed Junco. They arrive here in early October, and typically hang out in small bachelor groups. It’s exciting the see them return, as they have such a sweet trilling call. December is also an exciting month to participate in the Audubon-Christmas Bird Count. It’s a real census of all bird species across the nation. You can volunteer with a field team in your area, spending a nice (but chilly) easy day out, helping spot and count species. For more information click here. An alternative to the census is February’s Great Backyard Bird Count, also held by the Audubon Society, which you can join in on from the comfort of your own home! This is a perfect activity for classrooms and families of all ages! It will be my first year counting from my own feeders, so I’m excited to get to it, as we have heaps of California quail groups that dine out daily! Almost 10 years ago, I worked and lived in Yosemite National Park seasonally for a couple of summers while completing my Bachelor's of Fine Art Degree at the University of Kansas. It was an amazing time, hanging out in the park, without a care in the world! I didn't fully realize it at the time, but something about frolicking in the woods, and enjoying the high alpine wilderness of Tuolumne Meadows, would change and grow my artwork in a different direction. When I'm out on a trail, I typically spend my time observing the little things--the miniature details nature has to offer. I remember holding a Ponderosa pine cone petal one morning, spinning it around between my fingers, and thinking "Huh...this looks like a little bird!" Sure enough, the next day I began to design a simple plush body from fabric to pair with the pine cone petal, and the vision was complete! These lil' guys and gals have been making their way into many of my wall art pieces ever since. 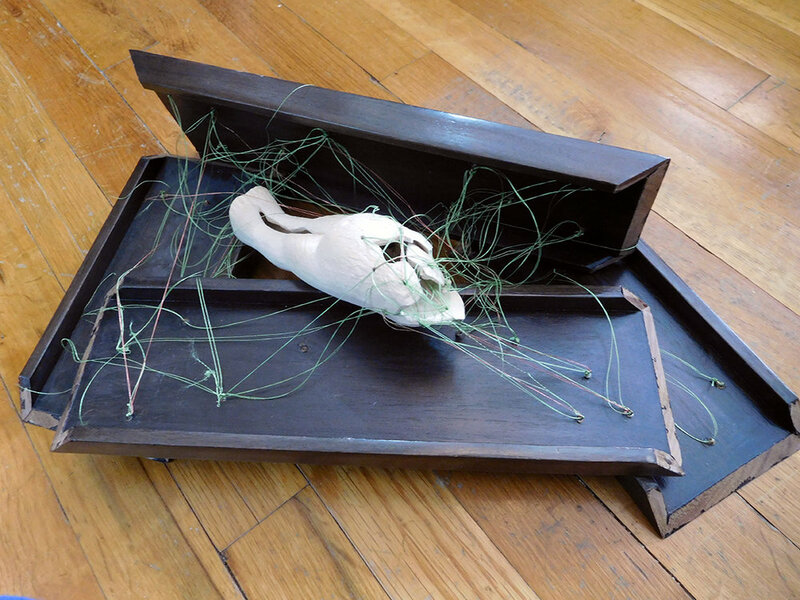 I assemble a composition that mimics social bird behaviors, integrating that with wood veneer and found objects. The best part about working with this media, is that each pine cone plush bird assemblage ignites it's own sort of personality, with all their particular colors and shapes. I can't help but reference Guira Cuckoo birds (above photos), as they individually have very robust personalities. They're known to be ruthless nest pirates, loud, yet endearing, gregarious birds. I've had the opportunity of spending many hours with these little guys at the Tracy Aviary in SLC, volunteering as site interpreter in the "Backyard Birds" exhibit. Guira Cuckoos are truly fun to watch! As you can imagine, inspiration came to me quick while creating these pine cone birds--stuffed to the brim with full-flavored character! Fun Fact! In 7th grade science class, I won the top 'Bird Brain Award' for audio and sight identification of various bird species. The pine cones that I use in all of my art work are not gathered in or from protected land or national parks. I specifically source these fallen Pondarosa pine cones locally, as I practice and encourage "leave no trace" principles, and am engaged in preserving wilderness areas for our future. I have been brainstorming for weeks now about how I'm going to stage my wall art, jewelry, and pottery at outdoor art festivals. I researched professional display systems, strolled through local festivals, and browsed online, to gather as many ideas as possible to create an interesting and functional display solution for my work. The project goals I needed to keep in mind were for it to be easily transportable, quickly assembled and collapsible, immune to windy weather, lightweight (one person set-up if needed), clean design, and cost effective. Dimension: 5 foot tall by 6 foot wide. Dual-sided display system that is completely collapsible for easy transport and set-up. One particular day, I stopped by one of my favorite places, ReStore - Salt Lake Valley Habitat for Humanity. 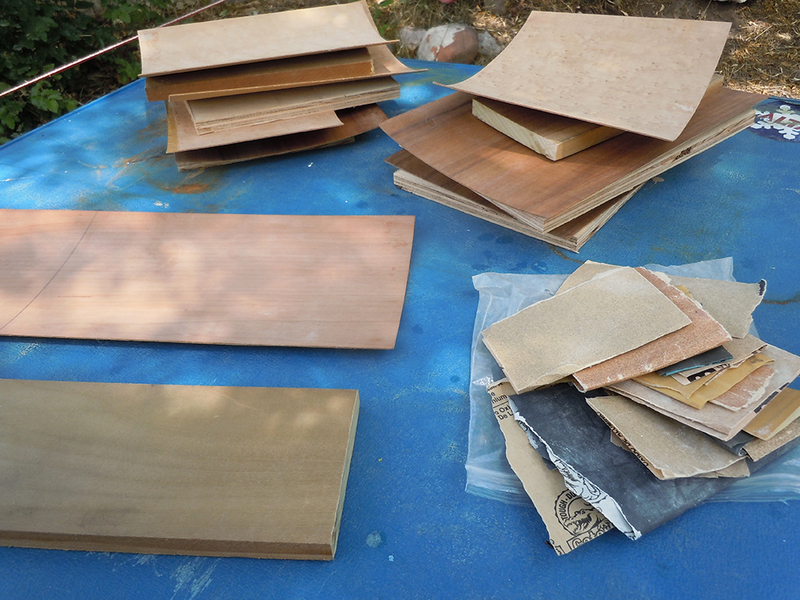 ReStore is like a thrift shop for building materials, furniture, etc. generously donated by businesses, contractors, or individuals. I highly recommend checking it out because you never know what you're going to find. The best part about purchasing from ReStore is that the proceeds help fund their humanitarian mission, and reduces building material ending up in a landfill! That day, I hit the jack pot for my project. 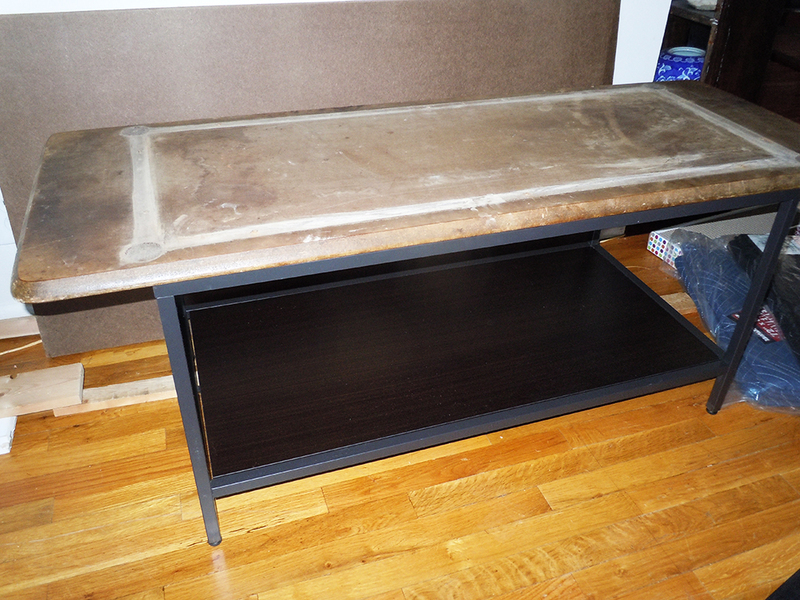 I salvaged 90% of my project's building material, paint, and hardware on a whim... I was so excited to get started transforming my idea into a tangible final product. As you can see flipping through the photos below, this is where all the designing took place from what I had on hand. I ran into a few construction obstacles like the hinges. I really wanted to use the tarnished brass hinges that came attached to the white cabinet doors, but those hinges couldn't bear the weight of the middle panel. I scrapped that idea in exchange for some heavy-duty brass hinges (the 10% non-salvaged hardware), which was a great decision. By simply removing all the hinge pins, I can quickly collapse the panels at ease. The main structure is now complete! Now plans are brewing to find a solution to hang my wall art, along with additional cosmetic applications. After numerous trips to ReStore (I make tasks harder than they need to be), 40 hours investment, and a sore body, I am so happy with this display system! I can't wait to use this gem under my tent at my first outdoor art festival on September 17th & 18th--the Urban Arts Festival in Salt Lake City, Utah! Stay tuned! Summer Pendant Collection - New Release July 11th! AEK Display Shop is now open! Hi everyone, and Happy May Day! After many months of hard work and preparation, my official AEK Display Etsy store is finally open! Come explore the pieces I have added so far, and let me know what you think! Thank you all so much for all your support, and be sure to check back often! Etsy Shop Opening Date Announcement! I'm excited to let all of you know that I've set the launch date for my Etsy shop! Mark your calendars--Grand Opening: May 1st, 2016! I've been working diligently to make each item available for you to shop online. 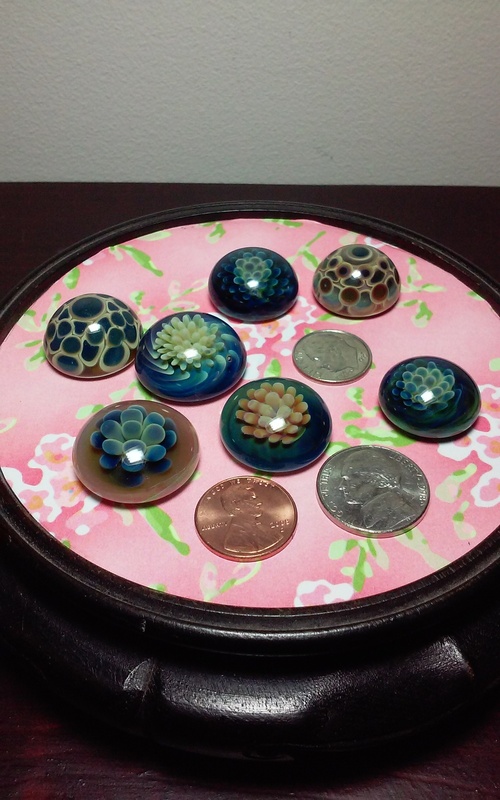 Pairing with Etsy will be an excellent resource, allowing you to discover unique pieces of my work, and supporting a local business! It's going to be a great and creative adventure for me. Thank you all for the support and encouragement, I feel blessed! Hi everyone! It's a whole new year! How is it almost March? I've left you all in suspense for months to reveal my "glass nugget" collaboration with glass artisan, Travis Kaufman! 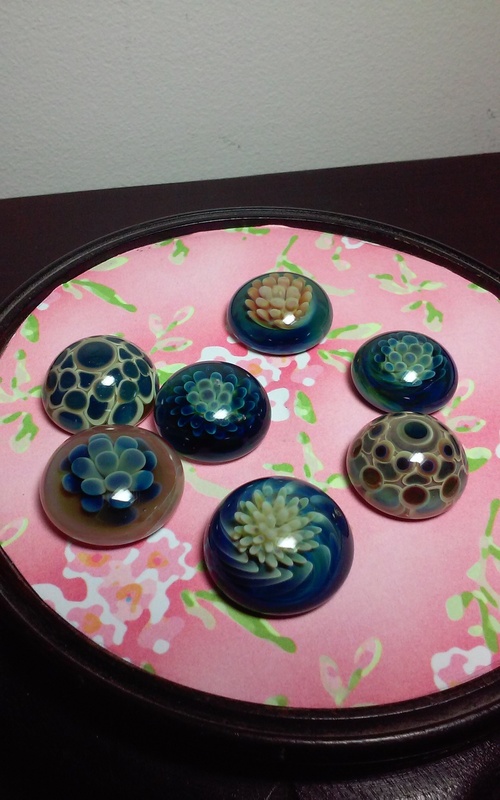 I've utilized careful design techniques and new materials to ensure proper setting of each glass cabochon. 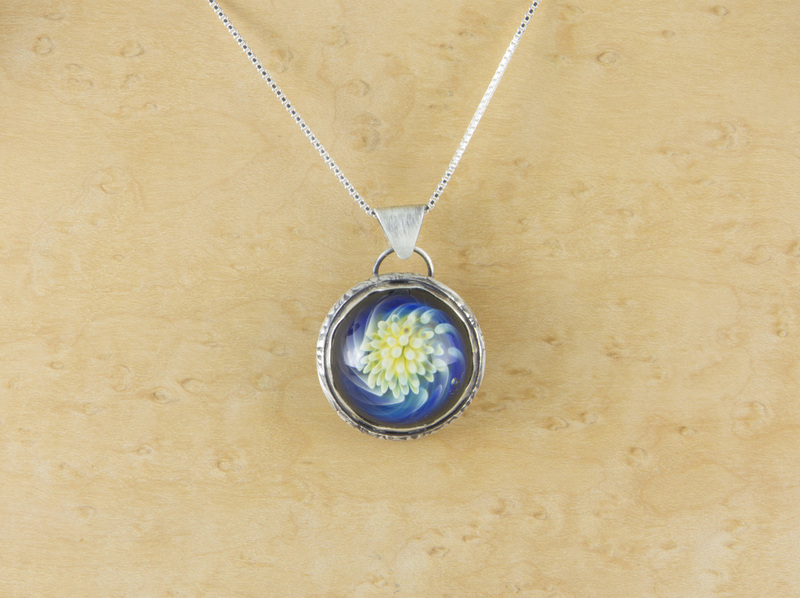 I'm really looking forward to continue working with Travis to create these one-of-a-kind glass pendants. My AEK Display Etsy shop is very close to going live, so let me know if there is anyone out there you'd like me to create a special pendant for! 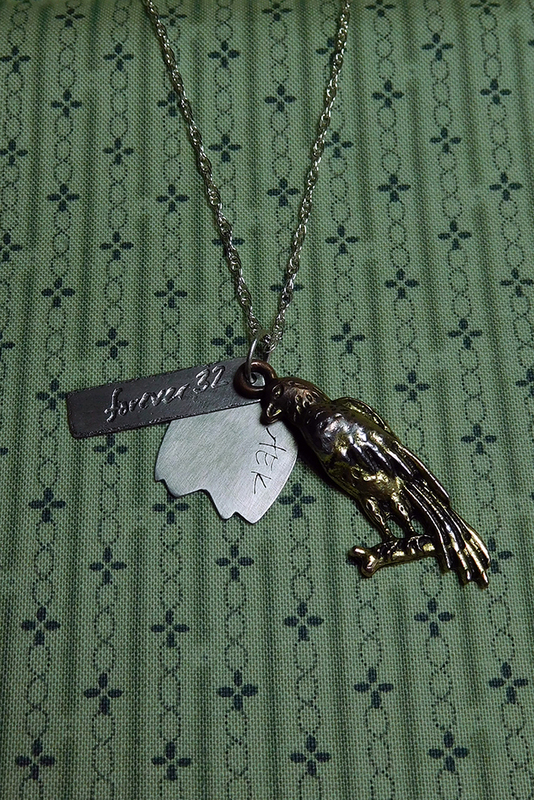 Also, be sure to stop by my Silversmith page, where there are additional detail photos of all these pieces! Adios! Kiss that cabin fever goodbye here in Salt Lake City! Travis Kaufman, a glass artisan from Kansas, reached out to me to mix-master our skills and collaborate. 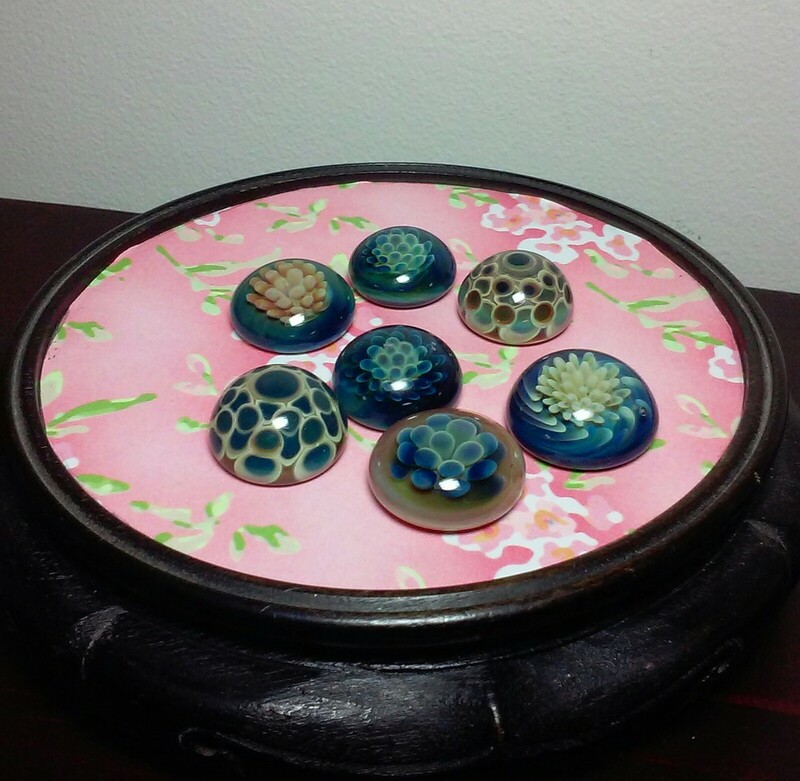 Each glass cabochon encases an 'opal' infused dimensional color field. His glass work is gorgeous--I could gaze all day at the memorizing shapes within. I am absolutely excited to be designing custom bezels for each piece. Let me perch one on your finger or around your neck! I'll keep you posted on Facebook! Thank you Travis, this will be a lot of fun! Thank you to all who stopped by my table at the ARUP Holiday Sale! It feels good to know that my creative endeavors have found a new place to call home, and will be unwrapped for the holidays. I appreciate all the kind and encouraging comments. I found it to be a successful Friday the 13th! Until next year, thanks ARUP Laboratories for organizing this event, and providing a space for artisans to set up shop for the day. Cheers! Okay, so I'm practicing my blogging skills today. Hold on to your britches! haha I'm getting anxious for my up-to-date portfolio website to go live! I retired 'lyrebirdworkshop.com' for two reasons. One, I didn't really have interest of selling my work on the site but rather used it as a portfolio review. Two, I need to keep up with to current standards of modern day web applications. It's been a refreshing experience to build a new website, reorganize my body of work, and change my domain name with the intent to sell handmade goods. Until then - peace out! Hi everyone! Just wanted to share a little tid-bit about the 'Skirt' series. Have you ever been to the Body Worlds Exhibit? Google search it if your curious. Body Worlds is an exhibit where human bodies donated to science are, needless to say, are sliced & diced, preserved using a plasination process. The bodies are placed on display in a very interesting juxtaposed positions. Each 'Skirt,' a figurative doll, were thoughtfully arranged to exhibit tension and psychological whimsy in which Body World's exhibit was much of my muse some odd years ago.